The Malaysian advertising scene seems to be changing lately. Advertisers who were once passive have evolved into active, more aggressive players to outshine each other. Even mentioning competitors' names doesn't seem to go against the local advertising laws. Last year, there was a public spat between Air Asia & Tiger Airways on which racial background has good understanding of Asian markets & better of managing an Asian team. This spur Air Asia to release an ad to mock its competitor, as I blogged about it here. Now we have two telco giants competing against each other to offer the most affordable iPhone 4 package. 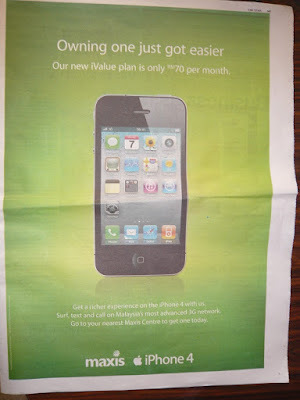 The history goes like this...Maxis was the first network provider to bring in the iPhone 4 package with plans starting from RM100 a month last year. 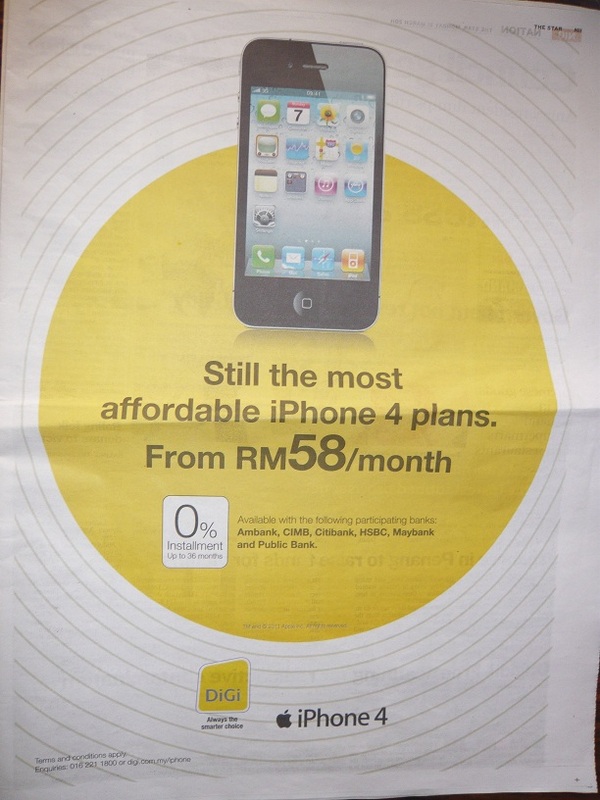 About 2 months later, DiGi managed to secure the deal with Apple to be the next provider to offer plans starting from RM58 a month to attract both new & existing subscribers. Of course, DiGi did tremendously well for its affordable package plan cuz it managed to not only attract new & existing subscribers but successfully converting Maxis customers into Digi's. And I'm not ashame to admit that I'm one of them! XD I believe this success stems from DiGi's main objective to be transparent in terms of charges, unlike Maxis' aplentiful hidden costs. Not surprising if many Maxis customers felt cheated. Anyways, back to the main point of my post. Realising this, I supposed Maxis is trying hard to regain its customers by introducing a slightly more affordable iPhone 4 plan.